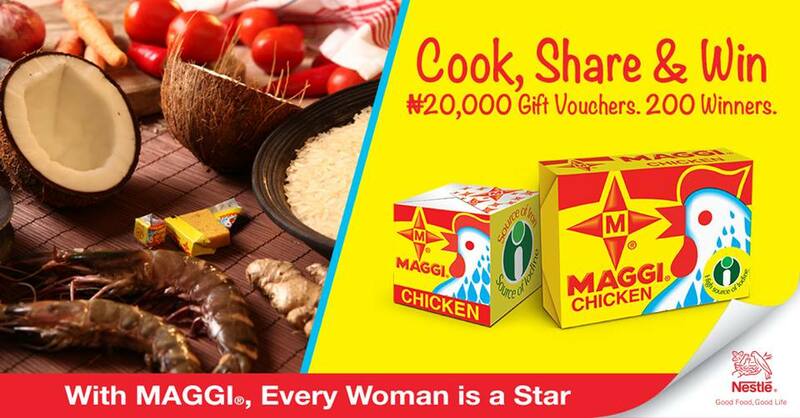 200 lucky stars will be going home with N20,000 gift cards this month. Upload your photo to the page address www.facebook.com/MAGGINigeria by February 12, 2016, 11:59PM PST. The “COOK, SHARE & WIN” contest in which entrants submit pictures of cooked meals. Winners are chosen based primarily but not exclusively on votes, style, creativity and overall appeal. · User can add unlimited number of submissions to the contest but can be rewarded only once during the whole contest by a gift voucher. o Three times a week, 8-10, pictures will be uploaded for public votes – selection will be based on style, creativity and overall appeal. · User can vote unlimited number of photos. One specific photo can receive only one vote from each particular user.